We’ve got two big events coming up next week. On Monday we’ve got our April Chapter Program meeting. Friday we’re hosting a cookout on the bayou. More info below. While you’re at it, check out this amazing op-ed our Healthcare-for-All Committee leader published in the Lens yesterday! She calls on Rep. Cedric Richmond to co-sponsor the Medicare for All Act. Local Dues have been re-established with a completely new system. We are an all-volunteer organization that is 100% member-funded, so local dues support our work and help keep us independent. You can sign up here. Finally – don’t forget we’ve got our chapter convention coming up in June. Our convention is one of our most important events of the year, where we elect new leadership and vote on important political resolutions. You can read a guide to the convention here. We’re working on our chapter program, which will help guide our work and focus our efforts as we organize for a better world. In February members identified four issues they want to focus more on: growing the chapter, labor organizing, healthcare justice and environmental issues. We’re getting together to brainstorm and develop action plans for our chapter based on member feedback, and we want everyone to come! Dinner provided, children welcome. Wheelchair accessible building. We’re having a cookout and everyone’s invited! Bring cold drinks or something to throw on the grill — or just bring yourself. Children welcome. Nearby bathroom available. Wheelchair accessibility info: event will be held in a grassy area. The bathroom is, unfortunately, not wheelchair accessible. Take a regular look at our events page for the latest meetings and events coming up. Sign up here to become a DSA member. Hello & thanks to everyone who attended our April general meeting. We had at least 80 attendees, making this our chapter’s biggest meeting yet! We were lucky to welcome Miriam from Familias Unidas en Accion as a guest speaker. 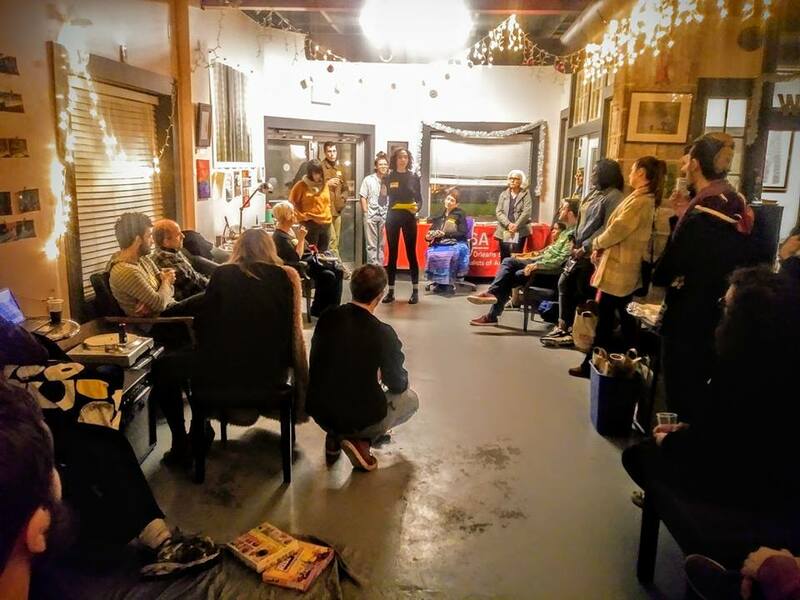 Hannah gave a recap from the Dallas DSA conference, where 10 delegates from our chapter met DSA leaders from all over Texas, Arkansas and Oklahoma. Josh went over some guidelines for our upcoming chapter convention in June, and we heard updates from all of our committees and caucuses. Jordan gave a report back on our chapter program development and our work to develop political proposals and strategies around priorities of growing & diversifying the chapter, labor organizing, ecosocialism and healthcare justice. Finally, we voted to approve proposed financial reforms to our chapter bylaws, to establish a Media Policy Working Group, and to endorse the Ecosocialist Green New Deal Principles. Read the minutes from Tuesday’s meeting here. There are so many ways to get plugged in to our work. If you attended our General Meeting, you already know a little bit about all of our different committees and upcoming events. Here’s a list of events we’ve got coming up that are all great ways to get involved in our chapter. 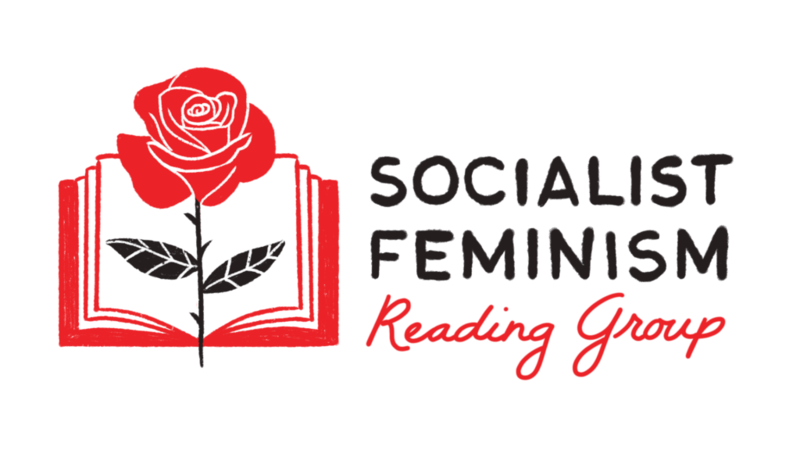 Roughly every other month the Socialist Feminist Caucus meets to discuss a book. This time we’re talking about adrienne maree brown’s Emergent Strategy. We strive to keep book club discussion open to all, so feel free to come even if you haven’t read the book! Join us for our monthly brake light clinic, where we fix brake lights for free to prevent unnecessary traffic stops and speak out against police violence. Join us on our next Medicare for All canvass! Every month (at least! ), the DSA New Orleans Health Care Committee goes out door-to-door in different neighborhoods to talk to our neighbors about the fight for Medicare for All. No experience or supplies necessary. Everyone is welcome to join! Join the Labor Committee for a Workplace Organizing 101 event. We’ll learn the basic steps of organinizing in our workplaces and how to come together to demand better conditions and dignity from our bosses. We invite workers from restaurants, factories, hospitals, schools and any other workplace to join us. Crawfish will be provided after the training. Accessibility info: the event will be held in a grassy area. No steps to get to bathroom. A monthly potluck for black, brown and indigenous people on the left to meet one another, share experiences and build community. click the link below for our calendar. In the introduction to v2 of New Orleans DSA’s Gimme a Brake! 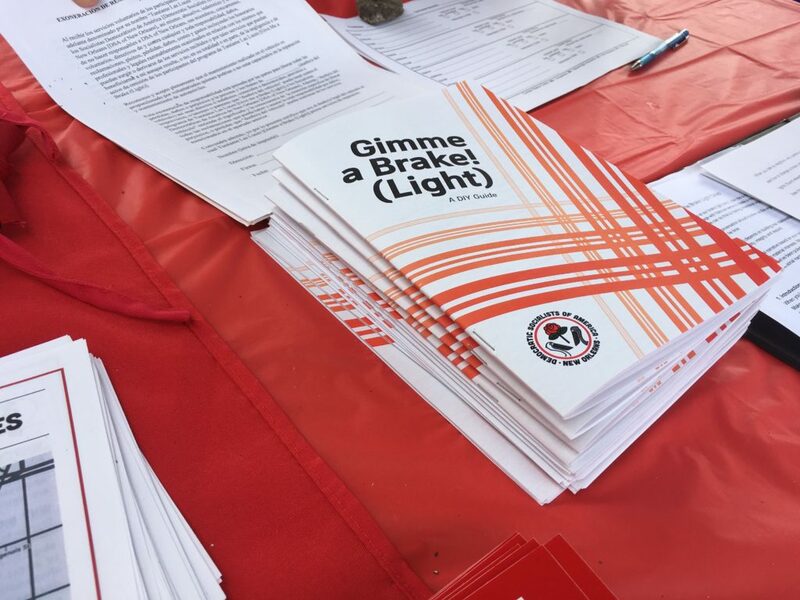 (Light): A DIY Guide, we refer to the brake light clinic as “genius.” We should be clear the “genius” referred to herein is not ourselves, but the person who came up with the idea of these clinics, DSA organizer Kaitlin Marone. What a cool idea! Many of us are writers, and we can tell you, a cool idea gets you pretty much nowhere. It doesn’t accomplish anything, on its own. What an idea can do is bring people together. And that’s what it did here in New Orleans. Marone took the idea to the newly-established DSA local. The brake light clinic’s success is not its idea: it is its execution, which is the work of many. Only two people* who worked on the original version of this guide had a hand in creating v2. That’s because in the past year and a half, the brake light clinics have gone from a cool idea to an ongoing project that has helped our chapter recruit members, develop new leadership, sharpen our political education, develop better organizing skills, and record our institutional knowledge. That is the work of many. This guide was built by consensus. We started the process by gathering information about clinics around the country and soliciting feedback from people who had built on our work. Then we met around a table in New Orleans, each of us outfitted with a printout of the old guide, plus every piece of organizing material we had developed since. And then we went, page by page, talking about whether each piece of information was necessary, clear, and accurate. Then we rewrote and came back and did it again. And again. It is revolutionary to be more proud of a group project – of true consensus – than an individual effort. As we release this v2 guide, we are orienting ourselves for deeper questions. How can we transform this project into a more sustained demand? In Louisiana, there is no part of life untouched by the carceral state. Should we fight to end money bail? Can we agitate to change the fee schedule for traffic violations? How can we leverage our position and build power to influence the 2020 District Attorney race in Orleans Parish? The work of many will continue. We are overjoyed that you’re on the journey with us. Happy New Year! We hope you had a restful holiday. We’ve got a few great events planned for this month that you should know about. This Saturday we’ll host our first brake light clinic of 2019. Next week we have a Special Meeting where we’ll elect a new at-large council member for the chapter, discuss the 2019 DSA national convention, and continue to strategize around our goals for the coming year. Later in the month, we’re teaching folks how to canvas for Medicare for All, and holding a potluck dinner for new and old members. We hope you’ll join us! As always, check our calendar for the most detailed and up to date information on all of our committee meetings and chapter events. Here is a statement for our upcoming special election to select a new at-large council member for the chapter. Only one person, Jordan F., has been nominated for to run in this election. The election will be held Monday, January 7th, 2019. Our chapter has grown incredibly in the past year! We’ve sharpened our skills, built up our committees, developed new leaders, and given new members a place to plug in. The space in this chapter for members to incubate different projects is one of our greatest strengths. What we need to do next is synthesize all this work into a cohesive political vision and concrete demands. Let’s leverage these projects in a way that escalates campaigns and builds victories. I will focus on this through building a strong chapter program process and by building up the capacity of committees. I’m running for this position because I want to be part of a chapter everyone can be proud of and because I want everyone to feel like they own the work we collectively do. The only way we can build this future is if we build it together. 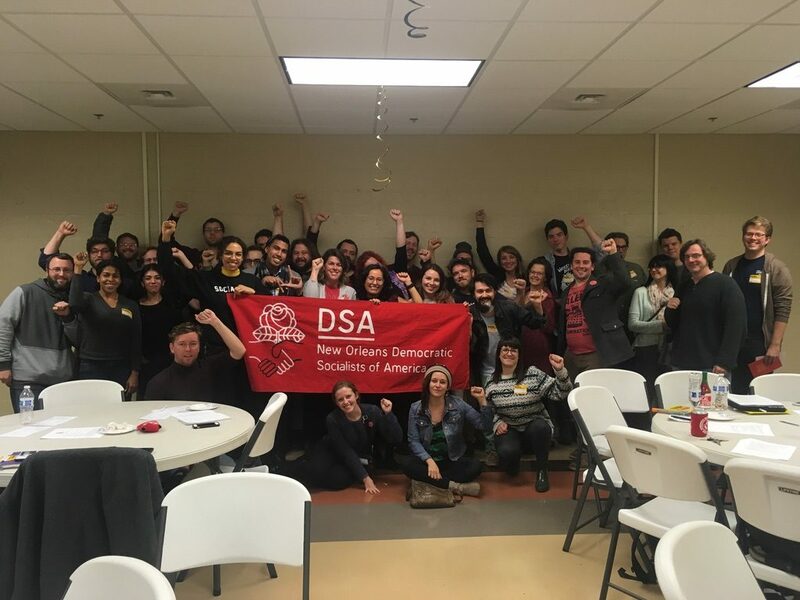 New Orleans DSA organizes for the power and benefit of working class and poor people in Louisiana, and to take power and influence from the wealthy and corporations. In our first electoral guide for the 2018 Midterm elections, we specifically choose not to endorse any candidates. There are currently no candidates for office whose platform includes our core values of fairness, direct democracy, and human dignity. We present this guide to offer historical context, information on candidates, and a vision of how these offices could function differently in our democracy. The scope of this guide is limited mainly to issues appearing on the Orleans Parish ballot. This is a reflection of the majority composition of our chapter’s membership. It also includes comments on some of the Jefferson Parish School Board races. Did you know that in Louisiana you can be convicted of a felony or sent to jail for life without a unanimous jury decision? This unjust rule dates back to the 1898 state convention when white supremacists put Jim Crow laws in Louisiana’s constitution. Louisiana residents have a chance to change this on November 6th by voting YES on Amendment 2. 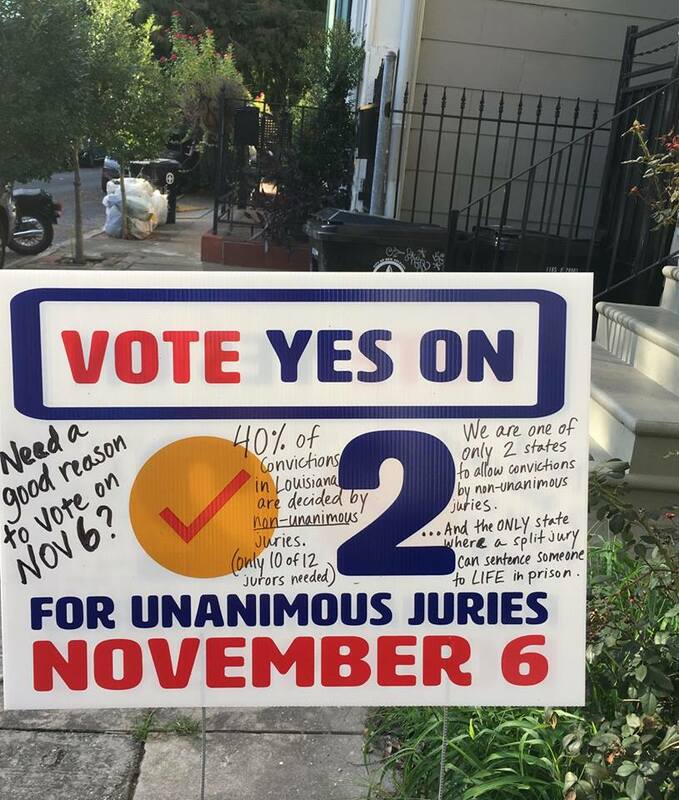 This sign spotted in the Marigny does a pretty great job illustrating why we need unanimous juries in Louisiana. This past week, our chapter joined the Unanimous Jury Coalition to phone bank and get the word out about Yes on 2. We stand in solidarity with trans and gender non-binary folks now and always. No matter what right wing fascists say or do, we’ll support our trans members & loved ones and continue to fight for their liberation and for the liberation of trans people everywhere. Trans rights are human rights.